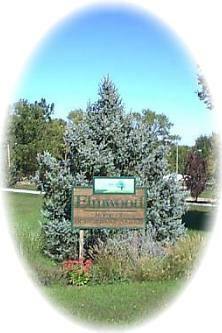 Surrounded by family farms and located amidst softly rolling hills that characterize Cass County lies the pleasant country town of Elmwood. Elmwood was founded in 1868 when a post office was established near a grove of Elm trees. Because of these trees, Postmaster David McCaig, a Civil War veteran, chose the name "Elmwood." By 1886 the town, containing just over 200 people, was large enough to incorporate. A successful effort brought a branch line of the Missouri Pacific Railroad from Union through Elmwood, to provide transportation for people wanting to go to either Lincoln or Omaha. For many years there were as many as eight trains daily. The line was discontinued in 1986, thus ending 100 years of service. Our most famous resident, Bess Streeter Aldrich, came from Iowa with her husband, who worked at American Exchange Bank. A writing of short stories prior to 1925, she began writing in earnest after the sudden death of her husband. Her books, which include "A Lantern in Her Hand", "White Bird Flying", "Rim of the Prairie," and others, have been translated into many languages. She was inducted into the Nebraska Hall of Fame in 1971. With an initial gift by Charles and Esther Miller, a foundation provided funds for the Bess Streeter Aldrich Library & Museum, which was dedicated in 1991. Since a good many of the pioneers were Civil War veterans, a G.A.R. Post was established and a hall built in 1886. This building, a meeting place for all civic and cultural groups, is now the home of the Elmwood American Legion and is one of the few remaining G.A.R. halls in Nebraska. Flying Wheels, the town's roller rink, is one of the few remaining birchwood rinks in the country. Additional recreational activities in the area include Grandpa's Woods, a lovely executive 9-hole golf course and if you have your bike, you can take the MOPAC bicycle trail to the trailhead, which is located in Elmwood's park, complete with a nice playground, eating shelters, and restrooms. In Elmwood you will find friendly merchants and a variety of businesses including antiques, crafts, and convenience stores. Elmwood has many lovely new homes. Our founders would be proud, as we continue to improve the community and keep their dream of an active town alive well into its second century. This 9-hole executive course offers a challenge to all types of golfers. Play through the many beautiful tree-lined fairways or over the winding creek. After your round of golf, sit down and relax in our clubhouse while enjoying your favorite beverage or snack. Visit the historical home of nationally renowned author and one of Nebraska's most widely read and enjoyed authors. Bess Streeter Aldrich, author of "A Lantern in Her Hand," enjoyed a writing career that spanned more than 40 years.